A liquid boron fertiliser for foliar application on all types of horticultural crops. 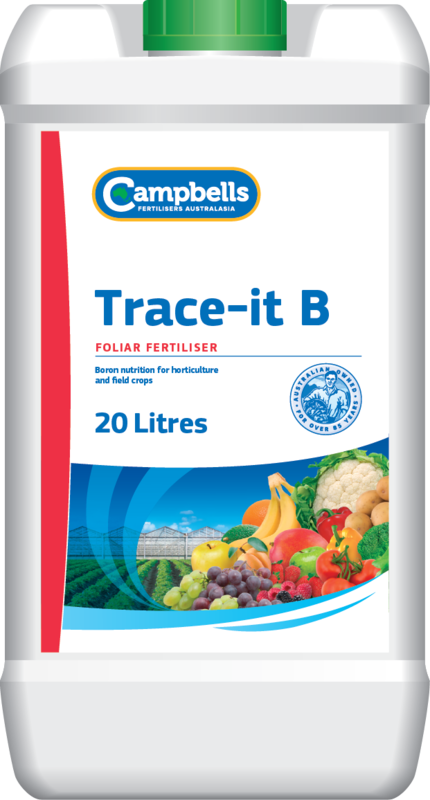 Campbells Trace-it B is a liquid fertiliser that is ideal for the prevention or correction of boron deficiencies in many horticultural crops. The nitrogen component of Trace-it B assists with effective uptake and transfer of boron within the plant. Boron deficiencies in plants generally affect the fruit or growing point of the plant and therefore can have potentially damaging implications for a range of horticultural crops. Boron levels are typically low in many Australian horticultural soils, especially those in the higher rainfall areas and supplementary boron nutrition is often required. Boron has an important role in the flowering process and this makes pre-flowering applications an important part of many annual horticultural fertiliser programs. Campbells Trace-it B is recommended for foliar application. Recommended rates of application vary between 1 to 4 L/ha – specific rates will depend on the crop, stage of crop development and the boron requirement. See the Product Label for comprehensive information on rates and application methods. Foliar applications should be avoided during extremes of climate and during flowering. Before application, seek advice from your Campbells Trace-it B distributor or your local agronomist.